Disclosure: This is a compensated post in collaboration with Gourmet Garden Herbs. As usual all opinions are my own. I often make soups for weekday lunches and light dinners, like many of us. They are tasty vessels for good health and filling meals. I’ve been eating this soup for decades, especially when I am feeling sick. While I’m not feeling sick, I’ve been working on perfecting this recipe, and making it easy enough for when I need it. This is the ultimate reason I love having Gourmet Garden herbs stashed in my freezer. I have gotten sick in the past, like everyone else. But I really don’t want to cook myself soup when I am not feeling well. And I equally don’t want to eat out, even when Brian brings me soup, I can only hang for a couple of days. So a recipe like this, with herbs like these, make for a better soup, and so quick to make. I am also out of town for a week, so I made a huge batch of this for Brian to take for lunch, or have for a quick dinner. Yes, I totally make him food, that’s how we roll, and it works for us. Admittedly he likes to eat out a bit more when I am not home, hitting up his favorites that may not be mine. So if I make one or two things, like this soup, I can say I feed him well lol! I also like this soup because it can easily be made vegetarian. Just swap the chicken stock for vegetable stock, and use tofu instead of chicken! It’s also gluten free and vegan! If you wanted add more vegetables, you could chop up some broccoli and add it at the end. 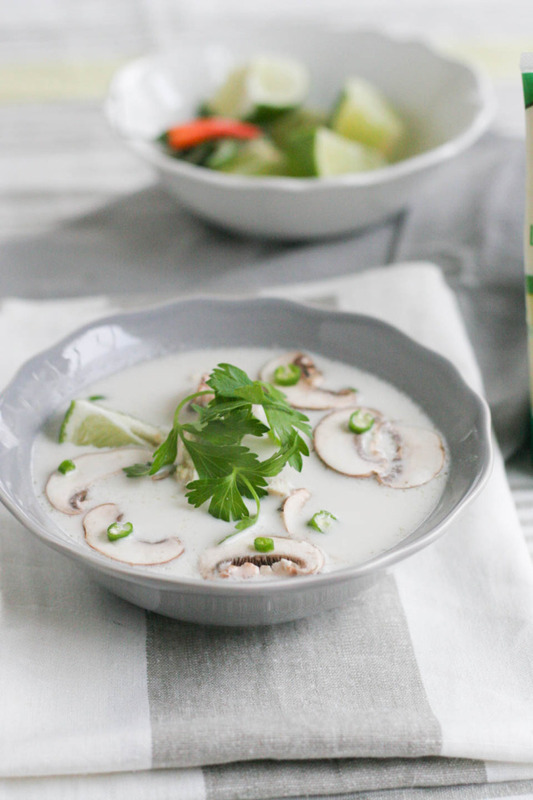 Have you had Tom Kha Soup before? 1. Place stock in a 6 quart pot over medium high heat. Bring to a boil, reduce to a simmer over low heat. Add lemongrass, ginger, and kafir leaves, stir to combine. Simmer uncovered on low for 20 minutes. Add 1/2 teaspoon fine sea salt, stir to combine. Remove kafir leaves. 2. Add chicken and chiles. Bring to a boil over high heat, reduce to a simmer on medium heat for 25 minutes, or until chicken is cooked through. Remove chicken, allow to cool enough to shred. 3. Add coconut milk over low heat, simmer for 10 minutes, remove chiles. Taste for seasoning, add salt and pepper. Stir to combine. Add mushrooms, and chicken. Serve warm with cilantro and lime wedges. Store leftovers in an airtight container for up to 3 days. I also add hot sauce for a kick. Tom Kha is my husband’s absolute favorite soup. I love how easy this recipe for it looks! I’ll take a big bowl, please! I love all of the delicious flavors. This soup would be perfect on this cold winter day! That soup looks amazing! 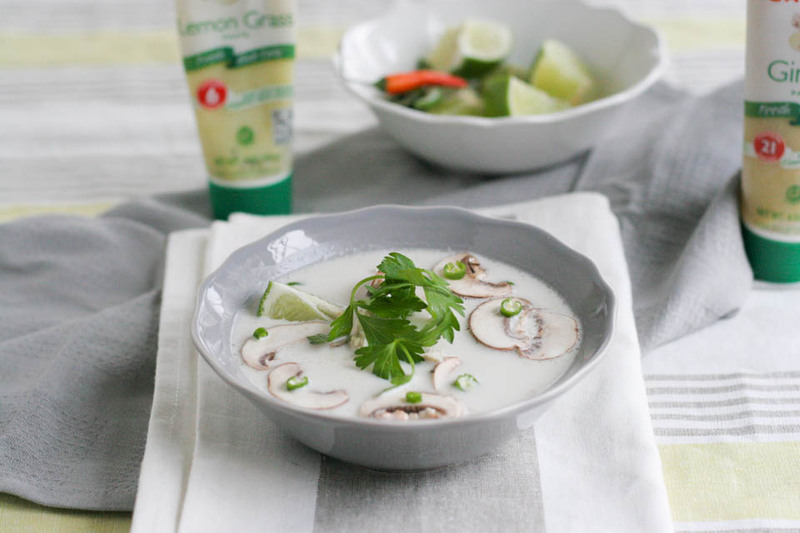 I love Gourmet Gardens lemongrass and always have a tube in my fridge for just this type of dish! I LOVE Tom Kha soup! I’ve never made it at home but I need to soon! I used to work for a Thai restaurant and had a cup everyday. Thanks for the gorgeous recipe! This is my all time favorite soup, not just Thai soup, ANY soup! I’ve often thought about making it at home but have yet to do so. I even have the Gourmet Gardens lemongrass in my fridge already! Need to get on it! I love Tom Kha Ga!!! It’s funny – I keep forgetting to pick up this lemongrass by Gourmet Gardens. I always want to have it and never do. Thanks for the reminder! Soups are my go-to meals for lunches and dinners, too. They’re so comforting and surprisingly simple to throw together. 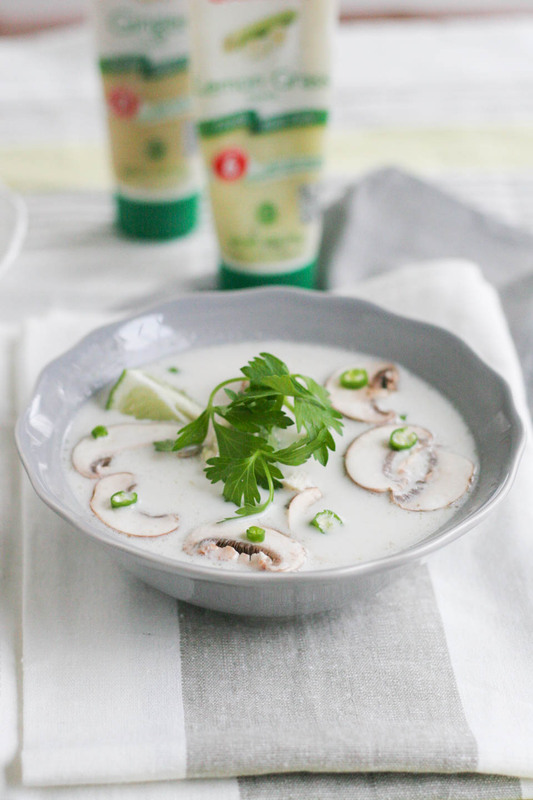 I can never resist a soup with coconut milk! I’ve never enjoyed Tom Kha, but it sure looks delicious! oo I just love Gourmet Garden! I have a bunch of their spices at home! I am going to love this soup! I totally agree with you! Awe, thank you so much, that is awesome. This is one of my favorite soups!!! And I love having those herbs in my fridge! pam (Sidewalk Shoes) recently posted..Why I Will Not Be Shopping at Sears Again!!! I’ve never had tom ka, but this sounds and looks amazing! Thank you! I think you would love it.